This is the healthy tuna melt, that will melt your heart and hunger. EVERY SINGLE TIME. And here's why: Dinner in 10 minutes. Plus, enough real food goodness to make it nutritious AND enough cheese to make it super YUM! Switch your oven grill on high and line a baking tray with baking paper. Cut the baguette into 2 even pieces and then slice each piece length ways. You will end up with 4 pieces. Transfer to your baking tray, cut side up. Rinse and thinly chop half the baby spinach, the celery and tomato and drain the tuna and corn. Next transfer the ingredients to a small bowl and stir through the mayonnaise until everything is well combined. 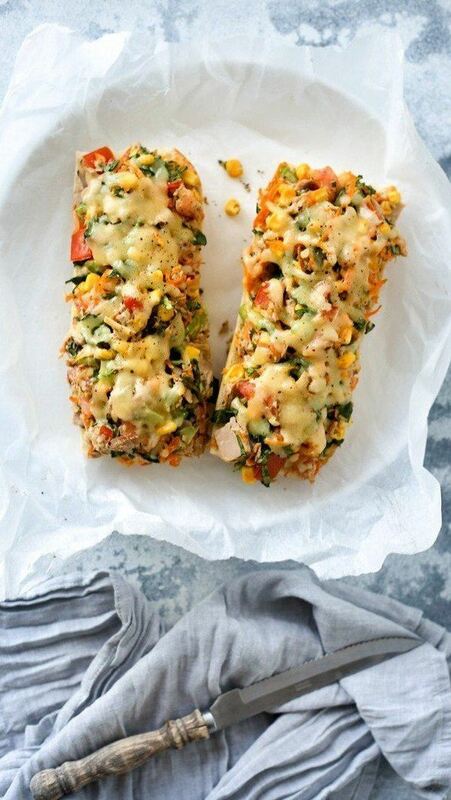 Top each piece of baguette with an even amount of mixture and then sprinkle cheese over the top. Transfer to the oven and grill for 5 minutes or until the cheese has melted. Remove from the oven and transfer two pieces to each plate. Serve with the extra baby spinach on the side.